Have you got the rhythm down yet? Are you back in the saddle so to speak? When it comes to bow hunting it feels like it can take a week or two to finally get used to waking up earlier, master walking quietly across parched leaves, and perfect the art of patience, little movement, and silence. Bow season is here and whether you are ready or not does not concern the deer and more importantly the fleeting month of October. Deer hunting during October is short lived as is, and more often than not, several opportunities go without recognition and “seizing”. The worst of these missed opportunities takes the form of deer hunting cold fronts during October. Digging deeper, many hunters will come to realize that it is the rapidly changing behavior of deer…not time itself that lets us perceive October as short. During the first part of the month or so, patterns exist, food sources are still intact, and there appears to be a very real opening to harvest a buck. However once the second and third week of October arrive everything changes. The shifting weather, food, hormones, landscape, and much more create a list of factors that seem to alter everything we knew about our property and the deer going into October. The second and third week of October (October 10th – 24th) seems to throw hunters a curve ball. By definition (to a hunter) a Cold Front is Mother Nature’s answer to the hunter’s mercy plead. Curve ball after curve ball, Mother Nature has taken us through the ringer no doubt, but it’s nice when she answers our prayers. A Cold front is a hunter’s saving grace so to speak. When deer movement seems to be slowing down, or unpredictable a cold front is a sudden snap to get deer and more importantly mature bucks on their feet. A Cold Front – advancing mass of cold air trailing the edge of a warm sector of a low-pressure system. When should you hunt a cold front? A great source for hunters as far as weather patterns and cold fronts is Weather Underground. Customize the 10 day weather forecast to show temperature, the chance of precipitation, pressure, wind speed, and humidity can also be an advantage. Hunters are by no means meteorologists, but knowing the simplest things can make a huge difference to the action you witness in the woods. In the picture, you can clearly see when the cold front is advancing. This graph was exported from a state in the Midwest this year, 2016, last week in fact from the date this blog is posted. From the period of Tuesday the 4th to Friday the 7th you can see a period of high temperature hovering around 80 degrees or so. Friday afternoon marks the entrance and arrival of the front. When the front is passing is typically seen as a drop in temperature > 5-10 degrees, and an increase in pressure. You will also either see nasty weather or precipitation increase as the front passes. The amount of temperature drop isn’t necessarily the main take away or reason a cold front is so productive. Notice the days before the cold front arrives. You have hunted these days before…the same boring, long, and hot days that are common in October. Low 80s High 70s during the day for several days in a row, plus the combination of nasty weather as the front arrives signifies how “productive” the cold front will be. Deer movement will be slow or what you will normally experience during the days beforehand. During the nasty spell of weather, deer will undergo intense stress. When the skies break open (Saturday-Sunday), pressure increases, and temperature plummets deer will be excited to get on their feet, especially to feed on available food sources. That covers when you should be deer hunting cold fronts, but not “where”. Unfortunately, the “where” is a bit trickier than the “when” and subject to a lot more opinion and variability. So up to this point we have told you “when” you might fake a sudden cough or take a vacation day off work, but the next important thing to decide is “where”. Where should you go “all in” on what seems to be your only and best chance at a buck in October. While we cannot give you a definitive answer that is a sure fire tree stand location, we can offer plenty of well thought out and proven suggestions. While October is leading up to highly anticipated action-packed weeks in November, the majority of the month’s deer activity revolves around one thing…FOOD. Two big food sources are competing during this time frame and a third is thrown into the mix if it is available. Above all acorns and cut corn fields should be on the hunter’s radar, but food plots can also be thrown into the mix. (Video)- As the second week of October arrives, strategies must change accordingly. In this week, two major players are present, acorns and October cold fronts. Acorns are a staple for deer during the month of October. White oak and red oak acorns rain down from mature timber canopies across the Whitetail’s range, offering a continuous and reliable food source. Unfortunately, it is also a plentiful food source…meaning the little package of carbs that is known as the acorn can spell disaster for hunters. This abundant food source’s availability means that deer do not have to work very hard or move very far to get to a food source. When deer are on acorns, it can be very hard to pattern them, but with the help of some landscape features like fingers, saddles, ridges, funnels, creek bottoms, and transition areas it can be done. Muddy TV’s Trail Cameras Weekly touches on these features and how acorns, with the addition of a cold front, could mean success. (Video)- On this week’s episode of Whitetail 101, Bill Winke discusses October bow hunting tactics, food sources, and October cold fronts. Cut corn fields, a common site this time of year is one of the only food sources that can pull deer off of acorns. As Bill Winke mentions in the video from Muddy TV’s Whitetail 101, freshly cut corn field offers “easy pickings” as far as deer are concerned. The missed kernels and mangled ears of corn can leave a significant amount of food left scattered across the tangle of stalks. The combine leaving the field is a dinner bell for deer and has the power to bring brutes out of the timber for a quick buffet. Again a cold front moving through, with some nasty weather in the forecast may just prompt a farmer for a quick harvest, meaning you will have a cut corn field to hunt over while deer hunting cold fronts, both bumping deer to their feet to feed. (Video)- This week on Muddy’s Trophy Pursuit, several team members have great encounters, close calls, and trail camera photos of mature Iowa bucks. As always a well-planted food plot, with the right species, in the right location can always be a dynamite spot to sit when deer are on their feet. As you can see in Trophy Pursuits Episode 6, the team encounter several hit list bucks moving through, around, and to food plots. Clovers, brassicas, and species like oats can attract deer throughout October and even through November and later. This is especially true for years with low acorn production, or in areas with little mature timber and ag crops. Food plots such as the ones you witness in this episode work great as staging areas and transition plots as deer begin to filter out into larger areas such as cut corn fields or oak flats. Overall the secret to perfecting deer hunting cold fronts and bow hunting in general in October is relying heavily upon your trail camera data. As you noticed in all the weekly deer hunting videos and web shows on Muddy TV this week (Trail Cameras Weekly, Whitetail 101, and Trophy Pursuit), they all relayed intel and information from their trail cameras to support their observations and predictions. Take the advice and do yourself a favor. Setup trail cameras based on the available food sources. Await an October cold front, and base your hunt around the most recent information you have….you won’t regret it. Trail cameras have quickly and undoubtedly become one of the most essential tools available to hunters, period. There is no question to whether or not a hunter should employ trail camera across his/her hunting property. The significance is common sense, but the knowledge of how to set up a trail camera properly is not as well known. Without the knowledge, a hunter cannot fully extract all of the valuable information a trail camera can give, essentially wasting the money, technology, and more importantly time…These trail camera tips and tactics should set you straight. Are you asking “how do I set up a trail camera?” read and watch below for a detailed how to. When setting up a trail camera, you have to consider many factors including trail camera location, if the trail camera will be attached to a tree or stake, the distance to the target area, clear field of view, aiming the camera in the right direction, keeping the trail camera scent free, and ensuring you select the right settings when setting it up. These trail camera tips and set up steps can be hard to remember when you are in the field so take notice now, and even create your own checklist to run through each time you set up cameras. For example trying to capture wildlife or deer utilization on a food plot might require a time-lapse or field scan feature, a trail might require a fast trigger speed, and a mineral site might require a video mode or multiple photo burst mode. Purchasing an overall great trail camera that has all of these features included, is a multifaceted bang-for-your-buck…literally. A trail camera with all of the following allows you to use it every part of the year in all different scenarios. Again, this is the first step, selecting a camera, and outlining exactly what intel you want to gather. After knowing these basics you can dive into actually setting up a trail camera in the field. The next step after determining what you want to use the trail camera for is selecting the trail camera location in order to capture that exact data. Defining what you want to achieve with your game camera will tell you where to put it, it’s really that simple. Trail camera location is step and trail camera tip number two in this trail camera guide, and after the initial cam requirements, is the next most important consideration. Food Plot Location: Either on a tree or a stake at a key entrance/exit point into or out of the food plot or high above the food plot for a time-lapse view. Trail Location: At a 45 degree angle from the trail. Perpendicular or straight on from the trail can either not capture the deer or wildlife walking, and directly behind or in front of can result in spooked game or a picture that may have features like antlers covered up. Bait/Mineral/Water/Feed Location: The best trail camera location for a mineral, bait, water, or feeding site is position roughly 10 yards, close enough to see detail but distant enough to see everything utilizing the site. Muddy has trail camera accessories that make it very easy to put a trail camera literally anywhere that you need. These trail camera accessories include trail camera stakes and trail camera mounts for either ground mounting or mounting on any sized tree or post. Both the Adjustable Trail Camera Support and the Dual Camera Ground Mount are important considerations when you are installing your trail camera. What is in the field of view for the trail camera? This is nearly as important as the consideration of how far the camera can detect and take pictures. As far as trail camera tips go, this one is often forgotten or goes unnoticed. What is in the FOV can determine a lot about the quality of intel you get. A branch, bush, tree, feeder, or another object in the FOV and frame can either set off the camera multiple times in the wind or block the image entirely. Objects can also interrupt the trail camera being able to detect wildlife, as well as catch the flash during the night. Human scent is a form of human pressure, and too much around a trail camera station could leave that site useless for a duration that is critical for collecting information. On another front, attractive scent can attract unwanted attention and/or damage to your camera. Putting out feed, a bait, or minerals for deer or other wildlife, and not paying attention to the scent and potential attraction that is on your hands before touching the trail camera can leave your camera smelling like food. Raccoons and bears both can be fairly hard on cameras when investigating them due to the scent and attraction of food or bait. This also gives more of a reason for ants to invade your camera. The size of the memory card you need largely depends on the trail camera settings you choose to set, and/or how often you check the camera. A trail camera set on video mode, with a 10-30 second delay over a bait site, will burn through memory quite fast, while a 3-photo-burst at 5 min intervals on the same site takes much longer to fill the same amount of memory. When deciding on how big a memory card you might need, consider what settings you will have the camera on, how long you plan on not checking and clearing the card, and the potential frequency of events the trail camera might encounter. Overall a good trail camera tip to remember is an 8GB memory card is a safe bet for most trail camera applications. In some situations like the Pro Cam 10 Bundle’s case, a memory card Is thrown in with the purchase of the camera. While some of the very first models of trail camera ran off of huge D batteries, most trail cameras now run off of AAs. These have more options, are more readily found, and are quite easy to set up with rechargeable batteries. These might be the best options, especially when running several trail cameras. Cold weather has quite an effect on technology so always be sure to check your trail cameras battery life during the fall and winter months. 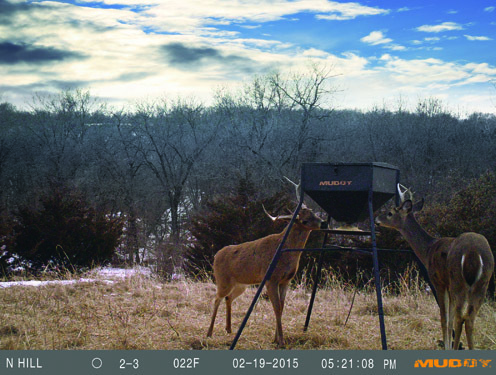 Both Muddy Trail Cameras, the Pro-Cam 12 and the Pro-Cam 10 have operating ranges between -10 and 140 degrees. With everything else optimized the most crucial step is putting the trail camera on the right settings, this is where most hunters mess up. Overall the trail camera settings are largely based upon what intel you wish to receive. However, certain scenarios and situations require specific settings in order to work. Trail camera tips for the settings aspect cannot simply be a broad overstatement, but instead require careful consideration and planning. Generally, use common sense…write down your goals, and think out which settings will give you that. We recognize the lack of information on trail camera settings based upon each scenario you encounter in the woods. Look out on the GoMuddy blog page for ann article specifically about trail camera settings based upon each situation. The last step and trail camera tip is simple…it’s trail camera security. Lock it up or lose it. Unfortunately, there are trespassers and given an opportunity to steal a camera, some will take it. Running a cable lock through your trail camera can easily deter this from happening. While going through the trail camera guide and steps on hot to set up a trail camera, we mentioned several different tactics such as setting up trail cameras for turkeys, trail camera surveys, minerals for deer, and scouting velvet whitetails in the summer. The links below will take you to those blogs! Trail cameras are an incredibly piece of technology that are continuing to grow in popularity each and every year. A trail camera provides hunters the ability to literally be in more than one place at one time and can provide a suite of invaluable information that can help when the time comes to hang tree stands or set hunting blinds and put the hunter in the best possible position to intercept that big mature buck this fall. Normally trail cameras start going up in late summer to determine patterns on velvet bucks, but spring should not be overlooked. With antlers already gaining inches every week, taking inventory now is possible, you just need to know how to capture velvet bucks in spring and early summer with your trail camera. (Video) This week Bill Winke Gets the mineral stations out, trophy rocks set, and trail cameras out in preparation to capture velvet bucks in spring and summer. Trail cameras are very easy to use and are becoming more and more inexpensive as each year passes. With the spring months well underway, it is not too early to begin taking inventory of the whitetails on your property, begin determining locations for your deer stands and hunting blinds, and start determining what the potential is for your farm to hold a giant this fall. For some reason, many whitetail deer hunters tend to make the assumption that there is no need to begin setting and running trail cameras until the late summer months of July and August. That could not be further from the truth! The trick that many successful whitetail deer hunters know is that running trail cameras is a twelve month out of the year effort that can yield some pretty amazing and extremely beneficial information that can have you eye level with a big whitetail buck this fall. So the question that many deer hunters ask when the topic of spring and summer trail camera placement comes up is simply, “why?” Why do we need to take the time to run trail cameras during the spring months? Well, the answer to that question is really very simple, the more information that you have the better decisions you can make. Running spring time trail cameras has very little to do with gathering information on deer antlers (although you will be able to monitor the growth of the bucks on your property)and more to do with simply gathering information pertaining to overall deer numbers and travel patterns of the deer on your farm. Deer, and especially mature whitetail bucks are truly their own individuals. They tend to have subtle traits, and things that they do that are specific to them. Typically, it’s these little “ticks” that can cause them to be so hard to hunt and have allowed them to grow and become mature. Examples of these traits might be how a specific deer responds to disturbances such as farm practices or activity on the farm. Others might be specific travel routes during various times of the year that might be different from the other bucks on the area. The bottom line is, the more information you have the more informed your decisions will be, which will help you to be successful this fall. It is pretty amazing just how different a whitetail deer behaves depending upon the time of the year. As deer hunters, the spring and summer months can often be overlooked and underappreciated in terms of its importance to a whitetails life cycle. During the summer months, food requirements change to forages that are higher in proteins and other nutrients that help adult does with pregnancy and lactation as well as helping those mature bucks produce antlers for the fall. As a result, the location of your trail cameras may not necessarily be the same ole’ oak tree that you have always used during the fall months. During the spring and early summer months, whitetail deer will tend to stay close to food in areas where they feel secure. They will tend to be more active during the over-night periods and less during the day, especially as the temperatures begin to increase. As such, you should focus your trail cameras towards heavily used travel routes. These are obviously sure fire locations to catch the deer on your property on their feet. In addition, the spring and summer months are great times to break the edge of the tree line and begin exploring the interior wood lots on the properties your hunt. Look for areas with signs of heavy browse and forage. During the spring and summer months, mature whitetails will tend to stay within a small area for most of the day, only venturing out during the over-night hours. If you can locate a big bucks “bedroom”, that can be very useful information that can be stowed away for the fall. In many cases, large bucks will often retreat back to these areas when the pressure gets too great during the hunting season, which is something you can use to your advantage when hanging tree stands or setting hunting blinds this fall. As spring gives way into early summer and spring rain is sucked into the plant growth and native browse, an opportunity comes up for spring and summer trail camera placement. Mineral and/or salt stations are craved by whitetails to balance their water uptake when eating this water filled browse. Their cravings and consistent visits to the stations makes for an unbeatable opportunity to monitor antler growth and behavior characteristics as well as get an inventory of bucks throughout the year. Running trail cameras is an exciting and fun activity that helps pass the months during the off season, and can really help make deer season last all year long. With that said it can also mean the difference between tag soup and wrapping your tag around the antler of that trophy buck this fall. If you take the time to let your trail camera work for you, and deploy them year round you just might be surprised what you can learn!